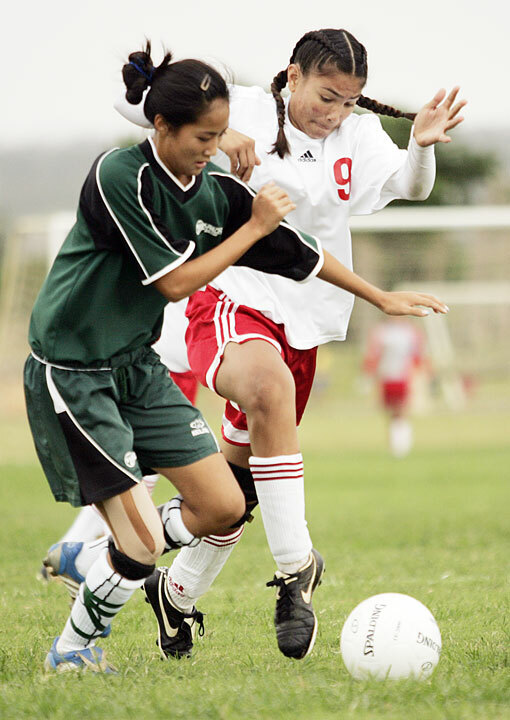 All it took was a quick burst by the Mid-Pacific girls soccer team to record its first state tournament victory. Sophomore Shannon Rosenberg and freshman Sahara Searle each scored goals in a 3-minute span midway through the first quarter that proved to be the difference as the Owls knocked off Waialua 3-0 yesterday in the first round of the Meadow Gold Dairies/HHSAA Girls Division II Soccer State Championships at Waipio Peninsula Soccer Park. Mid-Pacific (4-7-2) will face No. 4 seed Kapaa in a quarterfinal game today at 3 p.m.
"We want to win these games so we can meet Pac-Five in the championship," Rosenberg said. "We've got a nice little rivalry going in the ILH and our goal is to see them at the end." Pac-Five is the second seed in the first-ever division II state tournament for girls soccer and will begin its tournament run today against Christian Liberty. But before the Owls could look ahead to a potential all-ILH final, they had to get past a tough Bulldogs squad that overcame a slow start to battle MPI tough to the end. "This is the first experience for them in a tournament like this so I think they came out a little jittery," Waialua coach Charlyn Sales said. The first 20 minutes of the match was all Mid-Pacific as the Owls controlled the ball and pounded away at the goal. After missing a couple of early shots, Rosenberg scored the game's first goal in the 16th minute off a nice cross pass from Kayla Gomes. "I just got a really nice cross and put it in," Rosenberg said. The Owls quickly pushed the lead to 2-0 3 minutes later as Searle took the rebound off of a corner kick and tapped the ball past the Bulldogs' goalkeeper for another score. "All I had to do was roll it in, really," Searle said. "I want to give Paige (Young) the point because she's the one that made it happen." The Owls took 13 shots in the first half to just three for the Bulldogs, who made some adjustments at halftime and came out as the aggressors. In the second half, they managed to hold Mid-Pacific to just three shots and controlled the ball longer than the Owls did. "We kind of let down ourselves after we scored twice," Mid-Pacific coach Dave Pai said. "(Waialua) started to win a lot of balls and we need to work on keeping our composure for the entire game." Remi Wada, Brandee Botelho, Danielle Lutcher, and Risa Watkins all scored in the first 25 minutes of the game as the CaneFire (9-6) jumped on the Golden Hawks (6-7-1) early before cruising to the victory. Jenna Uyehara and Christy Watanabe each scored two goals as the Rough Riders (12-1-1) shut out the Cowgirls (6-11). Roosevelt moves on to face No. 1 seed Hawaii Prep. Michelle Bocon scored 5 minutes into the overtime period to send the Trojans into the quarterfinals to take on No. 3 seed Campbell. Beverly Quiamas and Moani Bertelmann opened the game with goals as Honokaa took an early 2-0 lead. St. Anthony's Rosie Ruff answered with back-to-back goals to tie the score at 2 heading into halftime. Bocon's first goal of the game in the 57th minute pushed the Trojans ahead 3-2, but Honokaa's April Cano scored in the final 10 minutes of regulation to send the game into overtime.